Good morning Chelan. Need coffee! 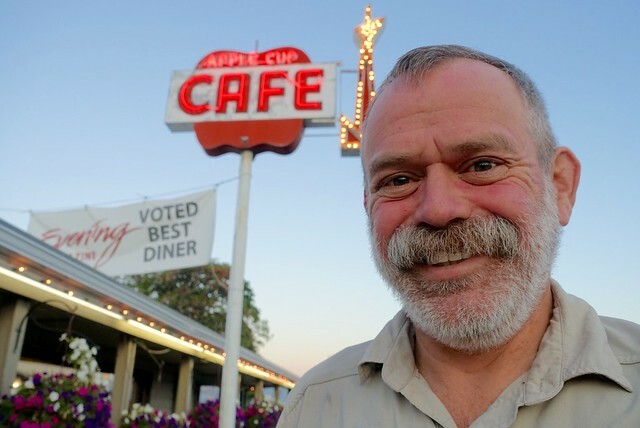 The smoke cleared overnight, and I got up at the usual 5:30am, in time to wander over to the Apple Cup Cafe for olde fashioned diner breakfast. The waitress sat me down (calling her a 'server' seems inappropriate for this vintage diner), facing the same direction in a road-facing vinyl booth as the other half a dozen men (and only men), digging into their greasy hash browns and eggs and bacon, breakfasting at 6am, on their way to pour concrete or open the shop or head into Wenatchee for supplies. My $10 omelette was mighty tasty, as was the coffee, black. The motel clerk gave me a ride in the ol' minivan shuttle to the ferry dock, apologizing for how dirty it was. It's just ash from the wildfires, no need to worry, and she said "yeah, you clean it off and it looks just as bad the next day these days." Check-in on the ferry was easy, then I settled in downstairs for the 2 1/2 hour ride up Lake Chelan. 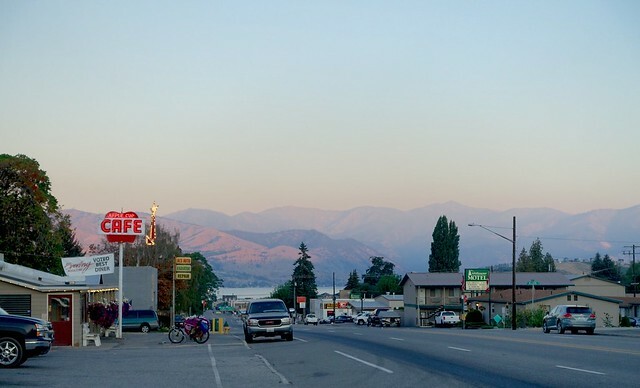 I've always been fascinated by Lake Chelan, this strange long thin S-shaped body of water, straddling the eastern Cascade foothills and the arid desert of eastern Washington. At the top of the lake is Stehekin, a settlement only reachable by boat, yet not an island--you can walk there, or out of there, as I plan on doing. As the ferry went up the lake, I saw why no road in was possible, the mountains rose abruptly from the lakes edge on both sides. For the first few miles, the ferry passed waterfront vacation homes clinging to the slopes (and on the eastern side, the mandatory Indian casino, but after half an hour the homes and casino and cell service fell bay the wayside. Smoke from the wildfires got denser and denser as well, the mountains on either lakeside disappearing into the murk. Soon we could hear, then watch the fire helicopters, scooping water out of the lake and then dowsing various spots on the fireline... and then there was Stehekin, across the mile-wide lake, with people dining at the resort lodge's deck, gawking at the action, an emergency carnival for their vacation amusement. Mary the manager of the lodge met me at the top of the stairs, directed me inside, and yay, my room was all ready so I dumped my pack in there then walked down to the waterfront to find the post office... which was right next to my room, doh. North Cascades Lodge, room 6, Stehekin. The postmaster and I chatted, he was busy relabelling PCT resupply boxes for Winthrop, and I signed the PCT register. Not many hikers coming through at all now. The hiker box had its standard mostly used fuel canisters and mystery powders in ziploc bags that may or may not be edible. 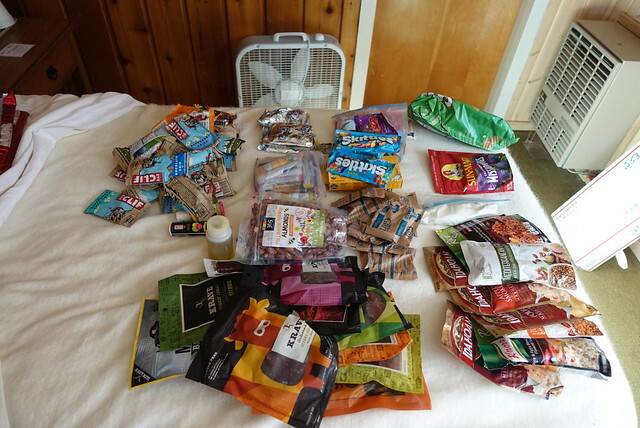 Why so many people insist on adhering to their strict diets on the PCT is a mystery to me--I know for me the PCT is a physical endeavor unlike anything I do at home, and what I eat on the trail is very different. I can't see myself making heaps of baggied up dehydrated stuff and living off it for five months after carefully parcelling it out into 27 different resupply packages. The PCT isn't really a wilderness trek, it's a series of four to six day backpacking trips, and there's usually a Safeway/Vons/Fred Meyer around on your break day, which has far more convenient (and tasty) food that's ready made for backpacking. 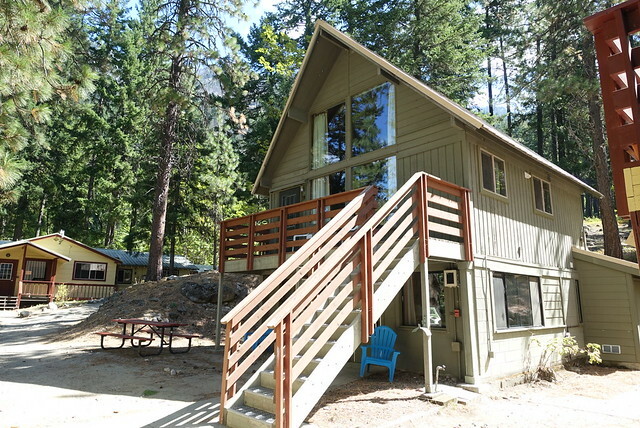 Once in Stehekin, I thought about renting a bike and exploring, but I really just wanted a nap. It was another hot day, up in the low 90s, and I was feeling just drowsy, so I napped for a couple of hours, then wandered around. The big poster with the current fire map was grabbing a lot of peoples attention, a woman sitting next to it said "Yep, I can't go out and do research work, so I get to finish this novel". She's counting plants in various spots, so of course I was pretty interested. She's just surveying the North Cascades as part of a project for a research organization at the University of British Columbia, doing some observations, with the goal of mapping plant changes due to climate change. Wow, cool, that'd be kinda my dream job. She laughed and said "it's a lot of looking at tiny plants in one meter square. Kinda boring." So I asked her what was really interesting, and mentioned that they've seen fireweed growing well above 2000 meters elevation in the area this year, much higher than any previous year. Fireweed is a pioneer and disturbance species so it'll be interesting to see if this is the way of the future, she added. No doubt it is; the climate definitely feels like it's changing. After some sorting of my ten days of food for the five days of walking--I wasn't able to eat all the food I bought for that skipped section from Stevens Pass to Stehekin hike--I felt like I should eat something. I went down to the lodge restaurant and gawked at the fire like the tourist I was, and a beer while I decided on what to nom for dinner. 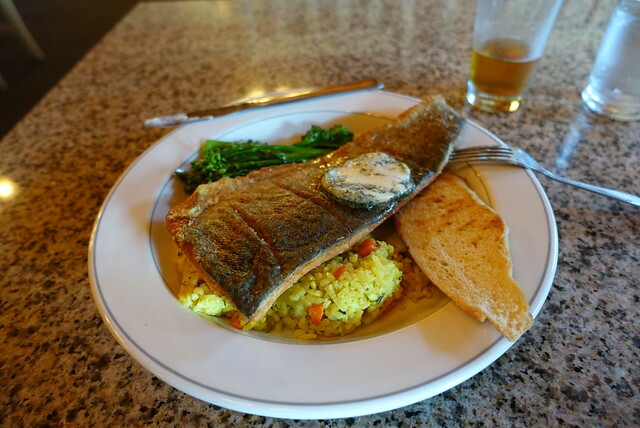 The restaurant was serving pan-broiled trout for dinner went down my marmot gullet, and oh was it tasty. Some fire crew came into the restuarant for dinner as well, I got to talking with one of them, John, with a very plush red beard, from Superior National Forest in Minnesota. He was real interested in my hike, how long it took, how many miles a day I walked, where I lived. When I said "San Diego" he said "You guys know about wildfires there!" and grinned. He was really liking this deployment, this was his second time in Washington state and he thought these mountains were wonderful... he wondered if he could get his Minnesotan wife to move out. I'd say go for it; it's wonderful here. As we chatted, the sun finally set, and we watched the fire and flames across the lake, always more spectacular after night. 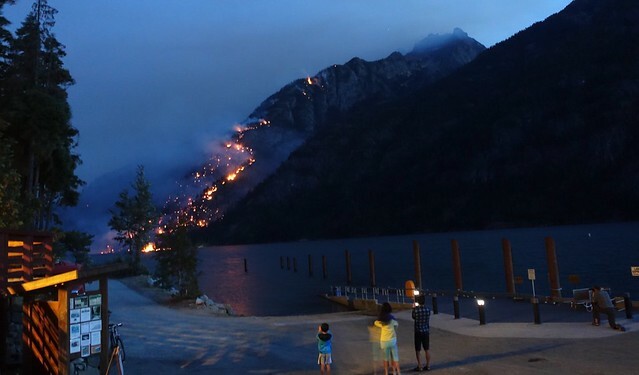 I decided earlier in the day to cut my stay in Stehekin a day short: originally I had two nights, to rest up after the hard up-and-downs of the Glacier Peak hike, but I didn't need the rest and frankly wanted to get away from the fire burning a mile away. So it was off to bed early for me, so I can get on down the road and away from lovely Stehekin for now. It's definitely a place I want to come back.